We’re Adestra. We have been providing enterprise-level digital marketing technology solutions to organizations around the globe since 2004. Our clients trust our proven email, automation, social, and mobile marketing technology to deliver successful and cutting-edge marketing programs to their valued customers. "Targeted Email Marketing Solutions, But a Bit Complex"
I use Adestra to send out e-newsletters to a subscriber database. As a magazine editor, my favorite thing about Adestra is that it allows me to easily edit the HTML within the newsletter and adjust the preview text that readers see. Adestra is a bit complex. Figuring out how to use all of the special features takes time and training. However, their customer service is top notch and has always helped me very quickly if I ran into a problem. It's expensive so it needs to be worth the money for your company! Although I don't deal with the budget end of it, I know from my managers that it's much more costly than many other similar softwares that can offer similar results. It has helped us increase our open rate on our e-newsletters thanks to the option to "resend" the newsletter to non-openers. I get to write a new subject line and send the same email out to people who didn't open it the first time around. "Great platform and even better team"
Adestra have been a true partner to us as we've grown as a business. The account management team have continued to help us to define our CRM strategy, culminating with us winning an award at the Engagement & Loyalty Awards, something we couldn't have done on our own. On top of the their support team, whether via live chat or email, is possibly the best I've dealt with. More of an area of development, rather than an actual dislike, but would be great to have a WYSIWYG editor for creating segments and email lists, rather than creating filters and rules. I have already recommended to many people and if CRM tools come up for selection in any future role I may have, Adestra would certainly be in the mix. Despite being a small team, with limited resources, the platform and support have enabled us the levels of targeting, personalisation and volumes usually associated with CRM from much bigger brands. "Account Team/Support is Second to None"
MessageFocus certainly meets our needs, but the Adestra team is what sets this company apart. Our users have glowing praise for the Support team, and the Account team have worked tirelessly to understand our needs (and our quirks). They've truly gone above and beyond to ensure that we get the most out of the platform. We had some hiccups during our account setup, with data requirements not being fully understood. Together, we found an interim solution that enabled us to keep moving forward, and Adestra dug in to understand our complexities and developed a custom solution to meet our current needs and set us up for the future. Adestra has enabled us to streamline email communication for all marketing teams across our organization, and we continue to see adoption across other areas of the business. We've seen resource and process efficiencies, and are seeing wider adoption of A/B testing, personalization and segmentation. "Powerful system that makes delivering successful automation campaigns easy"
Very easy to set up a basic MAP and even easier to add layers and visualise potential new paths and outcomes. Support are fantastic, account management is dedicated to supporting our teams with finding solutions and coming up with new ideas . The way Email editor modules work is not standardised. As I work across a multitude of different Workspaces, I would prefer my efforts to not be spend trying to figure out how a particular version of the editor work on a different workspace. Always opt for the email editor function as opposed to HTML as they are more versatile and quicker to use. Think about all of the module variables you would like in the editor from the outset so you can be more cost effective in your set up. Always ask Adestra for best practice support if in doubt. Improving customer interaction, adapting campaigns based on insightful reporting, improving customer conversion. It's a really great tool. "A very comprehensive system that delivers results"
We've used Adestra for email marketing for some time now and in the last year we have focused on mailing automation - often with triggered, personalised or interactive elements. We are very happy with the results, on several levels. Firstly, the automated programs have clearly boosted our open and click rates. Secondly, automation makes our day-to-day mailing workload more manageable. Finally, it's helped us spot further possibilities for new campaigns, which we hadn't thought of creating before. So all in all, Adestra automation has opened up big marketing opportunities for us. We find the APB intuitive, but sometimes the rest of the platform presents more of a challenge. So it's been a learning curve to use it to its fullest extent, though the support team has been helpful when we've got stuck. Now that we feel we've got to grips with it, we have been able to create some extremely effective campaigns on Adestra and will probably continue to discover even better ways to use it. Our mailing has two main facets - brand awareness and sales. We've found that our automated programs are mainly focused on branding. On the pure marketing side we use the platform to sell products and introduce new lines and offers. We of course know the mailing drives direct sales results. And what is interesting is that those customers who don't click-and-buy directly from the emails, refer back to the emails - so they play a 'assist' role in customers decision making for future purchases. "Very powerful platform, with abundance of support"
We would like to see more in depth integrations available for Magento, and would also like to see additional features within the editor, or even a complete "build your own" templating system which means we don't need to use our developers. Again, Adestra are always on hand to provide us with documentation, conference calls and to assist on the general on boarding and retention of clients. This is great for a busy email manager. "I use it everywhere I go"
The customer support is excellent which is the most important thing in any ESP because it means that you can overcome anything else. The email editor and the reporting are both super intuitive which is why I brought Adestra in when I joined Prospect. This is the third organisation I have been at that has invested in Adestra because it is such an upgrade on the in-house, bespoke or smaller off-the-shelf platforms they were using. There are a few things about the editor that I find mildly frustrating but I have no major complaints and never have. Most niggles are promptly sorted out by the customer support team. We are a small team and quickly realised we need a high level of automation to give the appearance to our customers that we are much bigger than we are. Using Adestra's Automated Programme Builder we have been able to convert several thousand free newsletter readers into paying magazine subscribers. "Power Platform with the Best Email Editor in the Market"
Adestra is part of our portfolio of marketing platforms we bring to and implement in the association market. It's one of our leading email marketing tools because of its ease of use, powerful email editor, unique account structure, deep feature set and visual automation program builder. The Adestra email editor not only allows a non-technical person to build out complex responsive layouts with no knowledge of HTML, it also allows your marketing and communications team to restrict which sections can be edited and exactly how specific sections can be manipulated. This capability allows the organization to control their brand as they delegate sending responsibilities to other business units within the organization. I wouldn't categorize this as a "dislike" but more of a "like to have". It would be great to be able to kick-off automation workflows using web hooks. We do a lot of integration work on top of the Adestra platform and this capability would solve some specific business cases for clients. We do have other mechanisms to accomplish these business cases but web hooks would be a more elegant solution. We've implemented Adestra along with our integration technology for dozens of associations which has made these organizations' communication/marketing teams more efficient with their email production leveraging the email editor and automation programs. The reporting is also excellent and allows these organizations to make informed strategic decisions about how they communicate with their members. "Pretty easy to use setting up and deploying emails"
Their support team is unparalleled. I am able to get on live chat and in seconds be talking to someone to trouble shoot an issue in my HTML or figure out how to send an AB test. My account rep is also very responsive and helps me with occasional questions. Reporting at a basic level is reliable and I like that you can compare your stats to industry benchmarks. I work in Adestra for the Business Marketing Association of Colorado, a nonprofit business networking group for which I run the email newsletter program on a volunteer basis. At BMA we are using it to deploy ongoing communications to our members, and it solves the problem well. At the moment we are not using it for any marketing automation/onboarding communications. 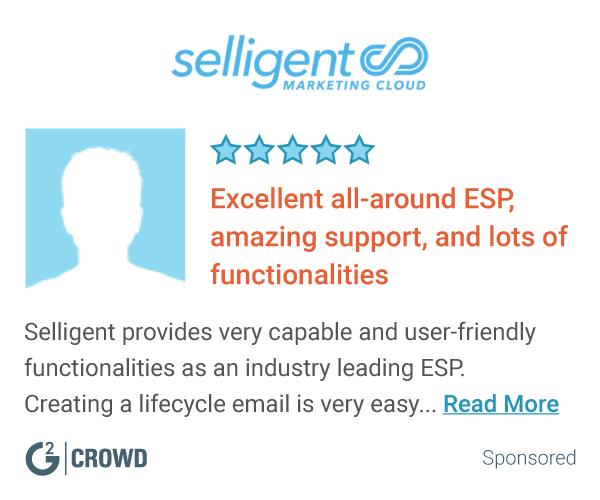 "Robust platform with the ability to automate and optimize email campaigns"
It's easy to create filters to segment your data into groups of users to target with personalized campaigns. The API integration makes it easy to continuously add new users to campaigns and the automation programs allow you to easily start and stop campaigns as needed. Robust reporting makes it easy to analyze results. Although AB testing is easy with this platform it does not include the statistical significance of the test results so I have to export the results and manually calculate the significance. It's easy to do, just an additional step needed to validate results. If you're looking for a robust email platform that allows you to continuously AB test your campaigns to improve open rates, click rates and purchase conversions then Adestra can help you take your email marketing to the next level. We're keeping users that have abandoned their cart during the checkout process engaged and reminding users that their software license is expiring so they can continue using the full featured product. As a result, we've seen increased engagement from our users and increased in revenue from email marketing. "A great upgrade from all our previous systems"
Adestra has proven to be a great asset for our team over the last two years. The platform is robust and provides great analytics, great user data and still maintains a simplicity that allows non-technical users to take advantage of the tools as well. While the system is super robust, there are a few report features/data sets that I'd like to be able to export easier. With an API, it may be more doable than I'm aware but we've run into a few scenarios where data was available in the system but we weren't able to export it the same way. Adestra has been our launching pad for weekly emails to our employees as well as regular emails to our students (90k+). We've been able to provide timely messages to all our audiences and keep track of the message effectiveness with Adestra. This in turns allows us to continually fine tune our messaging as well. We've also see a large growth in our prospective student/nurturing programs through Adestra, which has allowed us to reach out to specific targeted audiences and provide automated information about the programs they're interested in. "General Account Management support and implementation of APB"
The level of support has been amazing and Alex has been on hand for our queries in quick time. We use Adestra both for ourselves and as a prefered partner for our own clients, therefore, it is important that we have clear and timely communications when required. We recently implemented the Automated Programme Builder for one of our clients and this involved our client having to hop between and being able to understand 2 systems (both ourselves and Adestra). Our account manager Alex Mocanu was able to articulate what was required and set up a demo and assisted us through to delivery of the ABP product. There was nothing to dislike, therefore I cannot go into this further. We are utilising the ABP to use nurture campaigns and we hope to see greater click throughs and uptake. "Adestra is an Exceptional ESP!" On behalf of BrightWave, I'd like to thank Immanuel, Colin, and Erik for the tremendous effort they've put into ensuring our account is firing on all cylinders. As an customer-centric email agency, our goal is to provide top level service to our clientele, and the Adestra team has mirrored those efforts in their dealings with our team. In my nearly 10 years of digital marketing experience, this has been the single best support team I've had the pleasure of interacting with. We look forward to our continued partnership. There's nothing our team truly dislikes about the platform. Simple, effective and efficient email data management and deployment. "Adestra is key to our overall marketing effort." Adestra is user-friendly and has opened up so many doors for our email marketing efforts. We are not only sending better emails than before, but they are highly targeted. An added benefit is it's all happening in less time by using the templated emails. Some features are not intuitive when putting together an automated campaign. Adestra has created a way for us to target our emails better with list segmentation, and it's the first time we have been able to personalize an email. On top of that, a high benefit is how much time we're cutting down on putting together a campaign. The templates help that tremendously, as well as the automated campaigns that we can build one time and not have to touch every send. "Solid product with outstanding customer support/service"
First, I can't say enough about the customer support. Whether its online chat or a call, I always get an immediate answer (and a lot of patience as my skills challenge even the best rep). Even better is my account rep who patiently explains things to me, answers questions immediately (often in the same day) and is always available to provide his expertise to my challenge. The software is straightforward, easy to use and gives me a professional looking product I can send to my customers. As I mentioned, I am tech challenged. Some of the layout functions are not necessarily intuitive and the text controls in layout are not always the easiest. I have worked in several other platforms, however, and have had these same exact issues. What sets Adestra apart for me, is the support so that when I have these issues, I can resolve it immediately. As a small association with an equally small budget, our primary contact with members and prospects is through email. Adestra allows me to easily reach them and track whether they are opening our communications. We are in the process of utilizing the true power of Adestra through implementation of drip campaigns to prospects and former members. "Adestra's Message focus and The Dream Team!" Adestra's customer service is like nothing I have ever experienced in my long life of working. They are polite, respectful and super fast. There is nothing to dislike about the product or the service. Jump right in. Adestra not only provides everything we need to ensure we have control on our campaigns but their customer support is exceptional and reassuring. I am a new user and didnt know anyting at all about campaign marketing, with Adestra's help and attending their online webinars I have manage to really start to understand everything. Do attend their conferences and go the Christmas Quizz is a real hoot! I am responsible for data and brand marketing for 14 brands, Adestra are at the top of my favourite suppliers list - I wish they wrote programmes and run all the other software systems we have to jump through on a daily basis. "Great Customer Service and Email Client"
The customer service is great. The online chat is always helpful and if they don't have the solution to an issue there is almost always a resolution within a day or two. The automation features are also great and very simple to setup somewhat complex sending systems. Customer service is definitely the biggest plus here and i can't emphasize how great they are! Email list managment is also a good feature. They offer both Remote lists(fetches list from URL or FTP everyday) and API integration) which makes it very simple to manage a live, or day to day list. The drag and drop automation is great and makes it very quick and easy to setup email programs! The UI can be a little confusing and hard to work with. There are some oversights when it comes to reporting(no split test reporting). Account managment has been lacking and needs to be more responsive. Some of the more complex features of email automation are lacking and often require strange work arounds. The reporting in general can be a little weak and could be a little more specific and helpful. The biggest complaint though is probably that lack of a good A/B testing platform. Just figure out exactly what you need. Adestra sometimes struggles with complex email programs and can be a little hard to personalize sometimes. Simplified the import and sending of emails. Remarketing to customers has been made significantly easier. I joined my current organization about 10 months. I had worked previously with a competitor of Adestra for the similar service and had no previous knowledge or experience with Adestra. I have to say I have been impressed and feel fortunate to have been introduced to their company. We have a solid account contact and they have been great to work with. The last 10 months have been a heavy push for us to grow our program and they have risen up to support us in that initiative. Their background is a little different from our U.S. based, travel background. That may cause some delay at times, but they are eager to figure it out and work with us. Engagement and Action. We have a solid program in place, but we have had a difficult time cutting through the competition and noise (other travel emails) and driving our consumers to use our services in a trackable way. Our focus the last 10 months is driving more action and making it measurable. 3. Fantastic help and support - always quick to reply with detailed information. Deliverability tab hasn't always worked for me in the past. I strongly recommend working with Adestra. The amount of help and support they provide is amazing. They answer your queries in a prompt and detailed manner - very professional. Aside from the obvious - email marketing - Adestra have worked closely with us to improve deliverability of our mailers. This was always a problem in the past, but thankfully, with Adestra's help, this has now been resolved. "Adestra is the best platform we have seen since Salesforce Marketing Cloud"
The platform contains all the bells and whistles we relied on when using Salesforce. Since switching we are learing that the platform has much more to offer than some of the other Marketing Cloud platforms including IBM, Oracle and Adobe. Best part of the tool is the support. Real people, in country, on the phone, chat or email. They get an A+++ for that one! Platform has a learning curve to it. Lots of features, they should come up with a cheat sheet or quick start guide. Give them a call. Do a demo. You won't be sorry. Improve day to day communications with our website visitors. This is in the early stages of being realized. "Ease of setting up automation programs saves valuable time"
The Automation Program Builder has been fantastic for us as it has saved us a lot of time where automated campaigns are concerned. The visual element of the APB has been really useful when creating campaigns and series as it allows us to see which contacts will receive a campaign and at what point in their life cycle. We have seen lots of success using the ATB as it has freed up time to allow us to work on optimizing other campaigns. Also the support team are amazing! Having a live chat functionality is probably one of my favourite things - as queries get answered asap. Account Management is brilliant too - always quick to respond and ready to give advice on how to improve deliverability etc. Nothing to dislike as such. I've had a couple of technical issues in the past but the live chat support team have dealt with any issues extremely quickly. Spam checker and integrated Litmus client preview is fantastic. Many other suppliers charge for this. It is a necessity when checking campaign previews! We have wanted to increase our level of automation in emails to allow us to communicate with contacts at the correct time in their lifecycle with us for a while. The ATB in Adestra has allowed us to set this up very easily with no help from our development team, thus saving our teams valuable time. The ATB also allows us to set up multiple automated campaigns at any one time and easily organise these campaigns so they are delivered to the correct segments. The reporting allows us to optimise campaigns and make important changes. I love the ability to be able to split test live automated campaigns too to achieve maximum results. "Adestra Offers Top Notch Support and Services"
Adestra is user friendly and is easy to learn. The email creation flow is great; it guides you through each step from start to finish without having to navigate to different areas of the user-interface. The best thing about Adestra is their personnel. They provide great support with nice people and quick turnarounds. Colin our account manager is always quick to respond and help. We use an agency model with many account. It would be great if our child accounts could have more flexibility as far as data goes, such as, the ability to have suppression lists specific to account versus for the whole agency. I think the filtering UI could be more intuitive. I find it difficult to use and explain. It would be awesome if Adestra had prebuilt templates for those users who are not HTML savvy, as well as, be able to lock down areas in those templates. I do like the reporting features but I would like to see an aggregate reporting option that allows you to pull reports with all campaigns from all projects/workspaces for a time period. Adestra allows you to build and send emails quickly. They have great staff to help with strategy and deliverability. They are a personable group and provide a level of service you don't see with other email service providers. "A bit of a learning curve but worth it"
Adestra has a lot more capabilities than typical email marketing tools. You're able to split out your account into workspaces, where you can keep user lists separate. I also like all the feature that allows you to previous how your email would look on all different kinds of email platforms. There's definitely a learning curve to Adestra. The first time you use it, you'll think there are soooo many steps to sending one simple email. Once you learn it, it definitely gets faster, but it still feels like there are some steps that shouldn't exist. Also, the automation aspect is cool, but again, it takes a bit of time to create it, so if you're constantly creating different emails, you'll have to do that many times. If you're looking for a lot of capabilities to your email marketing, definitely look into Adestra. Adestra allows us to send emails to clients. The reporting features are great, and we're able to A/B test to see what works best. "Adestra - our partner in email"
Customer service has been quick and responsive, even with the support team in the UK (our office is in California, so there is a 7 or 8 hour time difference depending on season). Our account managers understand our company and work to bring relevant opportunities and technology to our attention. Live chat is great when it's online, although my work hours mean that I often don't have access to their team in the UK. Fortunately, Adestra has been very accommodating and has provided account support options in the United States as they grow their team over here. Their regular releases are adding new features constantly. Many of which have had a real impact on my workflow. Dynamic lists and automatic CSS inlining within the platform are my two most favorite recent additions. The data export manager is GREAT for organizing response data to use in ad-hoc analysis. Adestra has not always had access to bleeding edge technology, but that has had a negligible impact on my promo calendar. As a counterpoint to that... everything I use has been rock solid reliable, and they regularly add new features. Navigating the platform and using some of the more advanced features rely on the user (you!) being able to find them, sometimes deeply hidden in menus. Not an issue once you know where they live and how to use them. Take a good look at what you need from your email service provider. There was a time that we considered a change, but stuck with Adestra because we were able to realize all of our campaign goals on their platform and have been extremely happy with the human elements of the company (and their client support). They have a robust API available for the 'build it yourself' crowd, which we have utilized to add several homegrown features to our account. I tend not to trust WYSIWYG editors (personal opinion, and not a knock on the editor present within Adestra), and prefer to code HTML myself using an app like Sublime Text or Brackets, then upload into Adestra. That means I'm not limited to the built in tools and can use things like a W3C Validator, and other plugins to make my source code more legible and easier to check for correct syntax. Working like this is very smooth with Adestra. Sending highly relevant customer emails is a primary objective for NakedWines.com. Adestra works with us to leverage the technologies in their platform to maximize custom and dynamic content for our emails. I like how simple Adestra makes it to move from page to page. It's easy to jump in and out of tasks, save changes, and revisit items you may have left unfinished. They do a really good job of segmenting between email reach outs. Process is very streamlined, and easy to repeat once walked through. I wish there was a way to see the email reach out as receiver sees it, with full data on click rates so you could visualize the progression better. Right now it's only in list form, and can be confusing if you're not properly tabbing. We're trying to make sending and tracking email campaigns as easy and informative as possible, as it's something we do many times over on a weekly basis. It's been a smooth role out. "Reasonably robust email marketing platform with good analytics"
Adestra combines a comprehensive email campaign builder with a step-by-step checker that is better than many of it competitors. It’s a strong midweight solution for managing large lists with comprehensive analytics. The user interface is not the most intuitive and is less “quick-play” than MailChimp. I’m also not clear on the integration capabilities with larger platforms such as Salesforce or Shopify. As part of my role I need to manage large email campaigns and have a good sense of how those campaigns perform. "Intuitive, user-friendly, fully capable platform." In particular, the reporting is very thorough and useful. And the ability to automatically set up a follow-up email to nonresponders is a great feature that I use on a weekly, if not daily, basis. The filtering process to create segments is probably the one non-intuitive portion of the platform. The learning curve there was a bit steeper than the rest. But I'm really just nitpicking. Adestra is a platform that can perform the vast majority of your email marketing needs with a very easy-to-use interface, reasonable pricing, and an ever-improving feature set and infrastructure. Also, their support staff is impeccable. I work for an agency, so the ability to manage multiple clients through Workspaces is really nice and easy. "Excellent ESP Solution for our Agency Clients!" The Adestra client service experience has been 5 star and always white glove from contract through to support. The team is always there to help and goes out of their way to be accessible. The actual system interface is extremely intuitive, has advanced features, and allows us to segment by our agency client groups. As a full service ad agency, Adestra provides a great solution for our campaigns! There really isn't much to dislike about the system. There are always minor feature requests but they have either been added already or scheduled into future releases. Speak to other clients, trial the product, etc. We send email campaigns on behalf of our agency clients that are across various verticals with Fortune 1000 client base. The performance has been outstanding and our team loves using the Adestra system for its usability and advanced features. We have recognized consistent performance and have just signed a new larger contract with Adestra! "Better tools, better service \"
Our team at Adestra is always helpful in making sure we have what we need to succeed. Whether it's bringing all our information from our legacy ESP or building us a custom template for an ongoing campaign, Adestra has been readily available. The analytics, email editor and contact management far exceed previous experiences, and there seems to be a solution to any challenge we face. I didn't expect so much prep work to get our emails set up for easier design and delivery. Now that the set up is complete desiging emails is much easier than before. They will find a solution if you haven't yet. We now have better visibility to how our email marketing is being used and better tools to deliver our content. "Makes complexity approachable without limiting data capabilities. " The customer service. The software architecture. The thorough documentation. Integration capabilities. Macro and micro features are amazing when you want to see the forest from above the trees or if you need to get granular down to the seed of the pinecone. The list structure and list management is different than other platforms I've used. Instead of sending to containers of subscribers, you need to realize that you can send to specific data points associated to the contacts. You'll dislike it if you don't realize the liberating capabilities it provides. Think of filters instead of one off containers. User Permissions are a bit difficult because of the level of flexibility the platform provides. Read the manual first. Understand the system architecture and the empowerment that it provides. Consider the input and naming conventions you put in and how they will look as the output in the reporting. Custom reports are really awesome. The ability to custom tailor to a specific industry is very helpful. Multiple Unsub lists provide this. We've been able to custom tailor the structure from an agency perspective so our reporting is more beneficial and actionable for our clients. "What you see is what you get! No hidden fees. Great customer service"
Customer service is the best I've encountered. They are polite and attentive and always available. Having just gotten started with MessageFocus, I've had a ton of questions and they are available immediately on live chat or email me back usually within 30 minutes. The ability to see the screen I'm working with and help troubleshoot exactly what i'm trying to do makes it that much quicker to resolve. Everything they've demo'd for us on functionality has been accurate and achievable. We weren't promised anything that wasn't actually possible once we signed on. The interface is extremely easy to use. The layout makes it very self explanatory for a new user. The user guide is a great resource and is written for the average person to comprehend, not just someone in IT. The user interface is extremely easy to work with. There is a report feature where you can send a live URL to someone outside of Adestra to view stats of a campaign. This is a great feature, however, the open rate is a % of attempted rather than of delivered. The click rate is a % of opened. We use open/delivered and clicks/delivered company wide, so this may cause some confusion. But, I've put in a request and they said it is something they are working on. They have also offered a custom report which can be downloaded as a CSV file and shared to the business outside of Adestra. Definitely give it a shot. See about starting with a trial to make sure the tool is what you are looking for. The reps and customer success managers are with you every step of the way. Someone is always available for questions. Almost every question I've asked around a functionality and how it will fit with our current processes, is returned with an answer that is exactly what we were looking for. We were so jaded by other ESP's out there and their empty promises. Adestra is not like those other ESP's. They mean what they say and are with you every step of the way. We are still new to MessageFocus, but we can't wait to make use of the programs and trigger functionality. We love how quickly a follow up to nonresponders can be set up, and also how easily a new list from responders can be generated. We'll also be making use of the preference center soon to manage our unsubscribes and to create online forms. "Adestra Offers a Full-Featured Platform for Email Marketing, and Excellent Support"
Adestra offers some unique features for reporting and tracking that have proved useful. More important to us is the platform's focus on improving customer best-practices and facilitating that process. The filters and dynamic list features are incredibly useful for complex segmentation - and the marketing automation and conversion tracking features are also very useful additions. The company's Deliverability Management folks are also very knowledgable and pro-active. After having dealt with a variety of different email platforms over the years, I can say that this is the best value platform for mass marketing via email that I've had the good fortune to use. Some of the same features that make Adestra unique can also make it difficult to train other users on. It is a complex system with many features, and as such offers novice users a bewildering array of choices. My other concern so far is that you cannot remove contacts from your database directly, but have to filter those contacts into lists and ask Adestra to remove them. It is a bit of a learning curve, but leveraging the available features and understanding the overall data structure of the platform will stand you and your programs in good stead. We have increased our email volume dramatically over the last few years. Using Adestra, coupled with implementation of other best-practices, we have been able to experience over 99% deliverability while sending over 10 million emails each month. We see Adestra's service and superior platform as an important component of our overall list management strategy. "Setting the bar for customer support in the industry. " Adestra delivers ridiculously good customer support. There have been countless times when there was a technical issue at the zero hour and Adestra support has come through and saved the day. Seriously, everything from fixing the way html is rendering on a particular email client, to exporting, correcting and reimporting contact lists. They really go above and beyond. The html editor is not the most intuitive system, and the drag and drop editor is really limited (the fact that you can't use both on the same campaign creative seems like a miss). Customer support is unbelievable. If you typically run into technical issues, or struggle with the complexity of complicated list logic, this product can help. Scaling our email marketing business to match the growth of our company. We have turned email into a major factor in communicating with our customers on a regular cadence. "Starting a new partnership! Excellent full packaged ESP!" Adestra provides everything that you are looking for in an ESP. The templates save a lot of time with HTML creation. The support team is excellent. We are able to place Adestra in our customer’s hands and provide a robust marketing platform. The sales experience with John was excellent. The on-boarding process is seamless thanks to Toby. We are new users and have only been working with Adestra for the past couple months. We have no dislikes at this time. Adestra does not lack anything. We had demo's for over ten ESP's. Adestra stacked up against all other enterprise ESP's. Take a look around and reviwe others. Adestra was the benchmark that we compared all other. We are able to provide a state of the art email platform to our clients. "User friendly email marketing automation"
Adestra is easy to use and flexible. It can handle the essential functions of a standard class enterprise ESP. By far has one of the cleanest UI's. For most verticals, Adestra provides a solid platform to execute enterprise class objectives. My suggestion for more complex project needs, is to ensure during discovery that you are certain about what functionality are must haves. As an email marketing consultant, my clients come to me when trying to find the most optimum solution specific to their overall goal. Across the board, using Adestra clients are able to send timely messaging, drill down to the individual user and user habits and see a return on ROI based on those metrics. "As an agency we recommend Adestra often to our clients with great results and happy clients." Adestra has great navigation, meaning it moves with you throughout the platform. The user interface is intuitive and easy to pick up. There is a wealth of benefits I haven't even tapped into yet to expand to our client's like conversions and forms and the product is constantly improving and rolling out new features like native picture cropping. Lastly, Adestra support is extremely helpful - often going above and beyond to assist with very technical requests. The nature of email automation requires complex, abstract thinking beyond launching an email. It also requires the right data and fields with the right business goals. It can be challenging to test a program and get it right, but that is the nature of standing up an automation sequence. Lastly, some features are not baseline with the product and are available "On Demand". This could be seen as an upside because it would overwhelm many if rolled out with everything else, but as our clients advance we just know it is an upsell for some of these features. Adestra is great if you are not ready for a full blown expensive Marketing Automation program with landing pages, lead funnels, and personas, but want email automation and conversion tracking. Or it can be a great email service provider next to other lead generation software. With experience across multiple platforms, I think the winners with Adestra are the interface, access to support, and the training docs already available. We roll Adestra out in a phased approach and once the client has been on boarded, or they have turn over, they feel the platform is easy to adopt and pass on. For marketing and communication professionals, they can focus on the message and engagement rather than production and HTML with the WYSIWIG editor. The reporting dashboard is a nice visual to either buckets of email sends or individual campaigns and it goes deeper with geographic information, heat maps, and more. My clients have used the word, "Fun!" again with email, but to give that hard numbers they have seen a 5 point increase in click-through-rates with their responsive email templates. The segmentation of workspaces, projects, and campaigns is great. We have ours split up by which team member is sending the emails, so it makes dashboards a lot less cluttered and you only see the campaigns that you sent out. I like that there is an automation function; I haven't used it too much yet, but it's handy to not have to go back in and set up replies to each email. Their support is great - you can chat, email, call and they respond very quickly; they do also have a "FAQ" of sorts to walk you through how to everything. The UI is not great; it looks old and it's not always intuitive as to what things mean. You have to learn all of the terminology that doesn't always make sense and it's really confusing at first if you are switching from another tool. There's a lot that Adestra can do, but it takes time to learn all of the capabilities and how they work. Make sure you have time to learn and implement everything. Make sure your lists are as clean as possible especially in the beginning because you have to build up your sender reputation; we didn't and we ended up having to start over. We are using Adestra to send emails on behalf of our customers. It's been great having set pricing and not just increasing our spend each month because we added new people to email. "Email marketing solution that offers great analytics"
This software allows you to track so many variables related to your email marketing. The heatmap of emails is a great resource. I dislike that white-hot is used as a visual marker on the heatmap. As much as this may be scientific, it goes against the archetypal imagery associated with heat. If you are on the fence, give their podcast a listen. The conversations give you an idea of what the company is all about. There is also a good deal of insight to glean from the pod. I am helping to craft strategies that give us a leg up on other publications. We can isolate things our readers want and produce more of that content. We are finding better connections in the digital realm. "The Adestra platform is reliable, strategic, and organizational." Two major perks are the streamlined on-boarding and the dependability of the online chat support. On-boarding new clients is effortless and provides the luxury of creating custom domain authentications via the interface. Also, if a user needs some quick guidance or tips, the online chat support is there to assist. Building filters to search for certain subscriber groups can be a bit challenging at times and tricky to understand, but with the help of online chat support these tasks are easily achievable. My company and clients use the Adestra system daily, so system stability and up-time is extremely important. Dealing with millions of records demands capacity and power. This system has gained my approval and it's very comforting to have confidence in the system. Best support in the biz. We switched over because they're well-known for their client support. We were in the process of renegotiating our contract with the ESP that we were using when we started talking to Adestra. They met us in a fair place on price but more, when they demonstrated their product, they said something key, that they had live support available via email with quick turn arounds, phone or chat. Our previous ESP was supported through wiki articles. Huge value add. Since signing up with Adestra, they've been a great group to work with. Our account manager has been readily available to offer tips and assistance, the online chat function is a quick way to get fast responses and support emails have been responded to within two hours of sending them with solutions. I would highly recommend Adestra for their product without the added service but when you add that, it's a win! "Efficient, functional and highly integrative email marketing software"
If you are using Salesforce as your CRM and require a fully integrated email solution to work alongside it, you can't go wrong with Adestra. Adestra provides an excellent email marketing solution and its integration with Salesforce ensures that our account managers are all fully aware of and up-to-date with the email communications that have been despatched to their contacts. "Custom front end UI and API integration with Message Focus"
Customer support is excellent - the best we've seen in this industry. Given the nature of how we private label Message Focus into our own custom UI, we'd like a bit more customization when it comes to URLs and user access settings within Message Focus. Excellent choice! We are super satisfied. We use Message Focus for our backend email deployment and automated sequences. Many cloud services say they put customers first but very few actually live up to the claim. Adestra is the exception with excellent, knowledgable, speedy customer service. Quotes for development and design seem high, at least too high for my some of my clients! Streamlining customer lifecycle comms through automation. Achieving high levels of personalisation easily. Reports are good. The support is top-notch. Using the chat support, I've had help with problems big and small relating to HTML, Adestra functions, list filtering and even subject line advice. Response time is nearly instantaneous. For a small company and even smaller email marketing team, this is invaluable. Aside from a steep learning curve as others have mentioned, an area that could use improvement is navigation. For example, it's easy to go from a campaign report to a list, but harder to go back to the campaign using the platform's navigation buttons. This ties into the learning curve and is something you get use to. Take advantage of the support and documentation that Adestra offers and what your account representative suggests. Don't rush into switching. It takes some time, but is a great platform. From bringing email marketing in-house with Adestra, we've been able to turn around projects much quicker. The reports and recommendations provided by our rep are putting us on track to greatly improve our email metrics. "Powerful enterprise-level technology that's still regularly releasing powerful, innovative features"
There are not many enterprise level ESPs that improve their platform at the rate that Adestra does. Many ESPs seem to collect a big group of major clients and then sit on their eggs, while their technology grows old and outdated. I've been an Adestra client for over two years and use the platform heavily. The best part about the platform is that they are constantly releasing major new features to keep up with their clients' needs. Not only are they constantly developing cool, new stuff, but they really listen to your input. I've asked for at least 5 updates/enhancements and every single one of them has been implemented in less than 12 months. After 15+ years, the platform is incredibly feature rich and suited well for the most demanding email markers. The segmentation/filter tool is slightly difficult to use, although it has many advantages once you get used to it. The message workflow also has a learning curve, but it's very smooth once you get used to it (this goes for any enterprise-level application). The flexibility of the account structure is incredibly advantageous and unique among ESPs. Whether you are presetting templates, domains, from addresses, lists, IP addresses, footers, unsubscribe lists, databases, or even completely separate client accounts/brands, Adestra gives you an incredible amount of flexibility in how you setup and configure your account. The support is top notch. The chat window is not just a sales pitch — it's always manned with intelligent, english-speaking representatives who are ready to help, and will actually resolve your issue. The reporting section is very powerful, especially the geo-targeting, heatmap, social, device, conversion, and form reporting. They also have excellent list-based reporting which is lacking in many platforms. The automation program builder is extremely useful, although it certainly has a learning curve. The form builder is really powerful and flexible. They also offer a variety of message editors (WYSIWYG, Drag and Drop, Module Based, HTML code) to suit every type of user, which is really unique. "Adestra: Email Marketing for Growing Businesses"
Adestra's workspace is well organized. Campaigns can be nested within folders for project management. Users can be given 4 different levels of permission rights, allowing different departments to manage responsibilities. Reporting can be viewed and exported at the project or campaign level, so stats can be cumulative or campaign specific. A real-time web overview report can be quickly prepared and shared for non-user access. A built in campaign calendar provides an optional visual overview with navigation. Simple or dynamic lists (when combining multiple lists and filters) are easily uploaded via CSV file. List forms are easily created through a drag and drop editor. 3 levels of navigation can confuse beginners, but once a user becomes familiar with left and right navigation and breadcrumbs, the structure and functionality is actually convenient. It is my opinion that email marketing requires a specific skill set. And while advanced HTML is not required, a basic understanding of HTML is a plus with any ESP. With that said, the Adestra team is working on a drag-and-drop editor which will certainly round out the platform. If you are a medium-sized business and growing, Adestra is a solid platform to invest in. Adestra offers advanced functionality such as personalization, dynamic (conditional) content, lists with filters and exclusions, programmatic campaigns and welcomes series. Depending on your goals, the product features are rich. "Great platform and even better customer service"
Adestra is a feature packed and has a user friendly UI. Great testing options for campaigns as well as automation. Their new template builder makes it easy for clients to create great looking templates with no coding required. Reporting is great as is their new deliverability reports. What's not to like? Their weakest point was their template editor but since the roll out of their new editor it's great. I would suggest you take a demo of their platform and go over all your needs. You'll be pleasantly surprised. East automation setup makes creating welcome, cart abandonment and other automation a breeze. The benefits are faster times to market with campaigns and automation. "Adestra's platform is simple and user-friendly, yet delivers exactly what we need. " The chat feature is great. It offers a wonderful alternative while working on time-sensitive projects that require real-time support vs. email. Even for the largest of lists, campaigns are delivered quickly and efficiently and the analytic piece has proven very easy to integrate from our developer's perspective. I think the aesthetics of the platform sometimes leave a bit to be desired, but that is merely a personal opinion. The EDM designer is sometimes a bit glitchy, but is usually pretty easy to work through overall. With Adestra, we've gained the ability to increase the volume of our campaigns, while seamlessly managing the execution and analytics of multiple campaigns across many of our client's marketing efforts. As a somewhat new user to Adestra, my personal transition has been very fluid and has allowed me to singlehandledly manage the email marketing efforts for our organization. "Impressive Platform and Superb Support"
The Adestra platform is user-friendly and equally robust. The system's hierarchy is intuitive, and the built-in automation tools come in handy. And when it comes to reporting, Adestra's capabilities are very accommodating. Without nitpicking, no dislikes come to mind. Whenever a question has come up or an additional feature is needed we have found a workaround. If you are in need of an Email Marketing or Marketing Automation platform, I highly recommend Adestra. And if you feel a little overwhelmed or a little naive, the Manuals & Videos section (along with Adestra support) is excellent. Adestra scores big with deliverability and reporting. "Great platform with an abundance of bells and whistles!" We were driven to Adestra for many reasons including their multiple HTML editor and click and drag automation tools. The newest template editor allows clients to create nice looking templates with minimal HTML knowledge or experience. Adestra has easy to use marketing automation tools that allow users to easily design and edit multiple campaigns. There are so many bells and whistles included, it sometimes gets a little overwhelming. For our clients that use Adestra, many have had issues creating and sending emails that use responsive design and render correctly in all browsers. These template designers allow our customers to easily create great looking messages, improving message rendering and responsiveness. Adestra's Automation tool also has allowed our customer to easily create, edit and plan out various campaign programs. * We monitor all Adestra reviews to prevent fraudulent reviews and keep review quality high. We do not post reviews by company employees or direct competitors. Validated reviews require the user to submit a screenshot of the product containing their user ID, in order to verify a user is an actual user of the product. Hi there! Are you looking to implement a solution like Adestra?